I hate leaving unfinished business. When I do something I want to finish it so I can have closure, enjoy the fruits of my labor and check it off of my to do list. What a mess I was. Barely moved in and going, going, going from store to store and errand to errand like a woman possessed. I wore Mj out with my relentless planning and need to do so much so fast. He said, "Take a break, relax." I think I was driving him crazy. I wanted everything to be perfectly organized and I wanted it NOW! I'd walk into Wal Mart knowing I needed so many things but I was practically paralyzed with indecision over what to buy. I'd walk down aisles staring at this and that. I'd pull out my mile long list of things to buy but still not know what to do. What color? What size? Should I check another store? I'd spend all weekend going from one store to the next and still feel like I had accomplished nothing. You can't walk into Target and Bed Bath & Beyond one day and expect to have your house fully decorated and furnished the next. No siree. Not gonna happen. You might be able to do that in a studio. In fact, I think it took me about two weeks to set that up, but I can't expect to do that now. Not with a house that is 4 1/2 times the size. Duh! Making a house a home takes time. It doesn't happen over night and as soon as I realized that I was fine. Room by room, piece by piece it all comes together. In time. Now I don't worry so much about the fact that I know I need some rugs but I don't know which colors to get or that I definitely want bright pillows for our sectional but can't get them yet until I decide on drapes. The garage is totally disorganized and in need of some shelving and we need to get our closet done so Mj can actually fit some of his clothes in with mine but there is plenty of time to get to it. There is still those last few stubborn boxes filled with stuff you don't know what to do with but at least most of them are finally cleared out and we have all of our necessary appliances and furniture. We haven't put up any pictures on any walls yet and the two extra bedrooms are sort of a mess but I do have a color scheme for the guest bathroom and a cute rug and shower curtain to go along with it. We can't afford to get EVERYTHING at once even if it was possible. We got our dining room table and TV console delivered. Oh, did I ever agonize over this table. The sales lady just pulled up a chair and waited as I walked back and forth between our two top picks staring at them as if I was hoping the table itself would tell me what to do. But once I saw it in our house I knew I'd made the right decision. The shutters and blinds were installed too and they look great. My mom was down visiting and we just oohed and awed over how pretty the plantation shutters are and how much they change the look of the room. It's so much fun watching as each addition transforms the space and helpful how each new piece gives way to ideas for the next. I watch a lot way too much HGTV. I'm no designer but I see all these beautiful rooms on there and now that I finally have a home of my own to decorate I want to do it right. I know how I want my house to look but I just don't quite know how to do it. I've decided not to worry that I am hopeless and won't be able to handle the decor which Mj has left me in charge of. My over ambitious attempt to get everything done at once made me feel like I wasn't capable of doing it at all but I realize now that's not necessarily the case. Just because I don't already have a color scheme in mind for the living room yet doesn't mean I never will. Buying the house was stressful but this is the fun part and it isn't going to happen over night. Like most everything else it's a work in progress and rather then worry about what I think I don't know I've decided that I am just going to enjoy the process. We already love our house so when you really think about it our house already is our home and anything else is just extra. Awww, I so agree with you and feel the same way about my house, well apartment. After we bought it, there was so much to do and I wanted it all done NOW. The Mr. had to really explain to me that I didn't need to do everything at once. After 4 years, it's still not completely done but that's another project for after the wedding. Yours seems to be getting there very nicely. 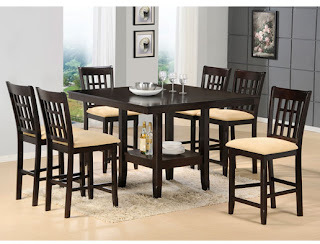 Love that dining furniture. 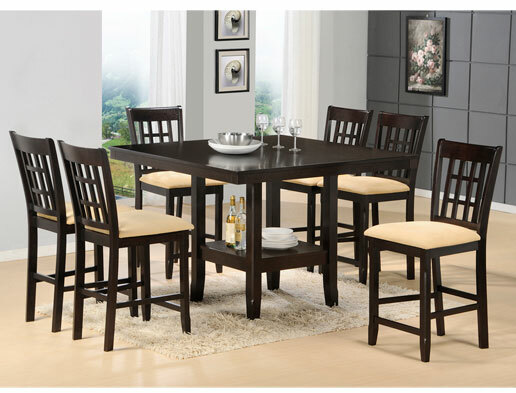 I love the table and chairs you picked out. It seems to be all coming together pretty good. Sometimes it takes a while to make decisions. i love the tables and chairs! I have been in my house for 2 years and still working on making it a home! either the money isn't there or I'm undecided or like you said, throw pillows depend on the curtains... I wish I could just buy whatever I wanted but I guess that's not an option... unless i hit the lottery... or divorce and marry someone rish :-) Good luck with everything! Just found and started following! I am enjoying reading you blog! The dining room set looks awesome. It takes time. And you are off to a great start. great blog found through Mauritz blog, ...now following, l don't have a house yet and can imagine how decorating one can feel like..just moving into a new apartment sooner, but learnt that reading design magazines or online design websites can do a great deal...visit my blog sometime!